Artist Pure Evil is a descendant of Sir Thomas More, the infamous Lord Chancellor and author of ‘Utopia’ who was beheaded by King Henry VIII, he inherited his ancestor’s fascination with Dystopia and the mythology that surrounds the Apocalypse. This exploration of the darker side is evident in Pure Evil’s oeuvre, notably in his recent series of crying female icons of contemporary culture that experienced sadness or tragedy during their life, including Sharon Tate and Jackie Kennedy. Pure Evil’s name is synonymous with his signature tag: fanged bunny rabbits which he started to spray paint after spending 10 years in California as a designer and becoming influenced by West Coast Graffiti artists. 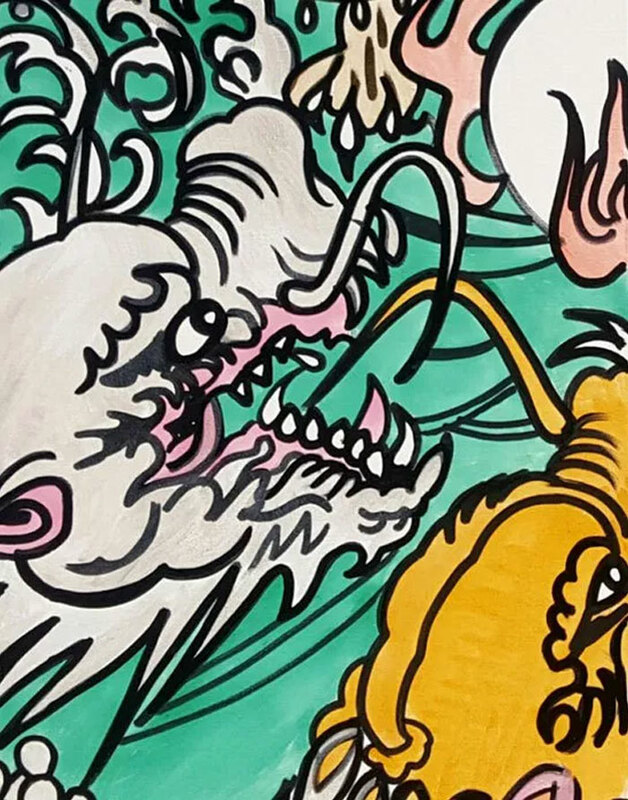 The works in his latest solo exhibition ‘The Temple of Broken Hearts’ are a departure for Pure Evil, and feature imagery that he has not examined before such as Chinese dragons and Buddhist Temples. This new series of 8 paintings were inspired by a very personal tragedy experienced by the artist, which led to a trip to Asia and a spiritual journey in search of healing. The new paintings examine the healing effect of meditation and the transformative effect of ritual, with the act of creating these images representing a cathartic process for the artist. The centrepiece of the exhibition is a diptych based on the Buddhist Eight-Fold path to enlightenment. The Eight-fold Path is the fourth of the Four Noble Truths, which were the Buddha’s first teachings. All subsequent teachings flowed from this foundation. The Four Noble Truths; The Noble Truth of the reality of Dukkha as part of conditioned existence (Dukkha meaning ‘that which is difficult to bear’); The Noble Truth that Dukkha has a causal arising (defined as grasping and clinging or aversion); The Noble Truth of the end of Dukkha (Nirvana); The Noble Truth of the Path that leads to Awakening.